1 Learn how to successfully sell your farm produce online...a comprehensive guide! 2 Our experience in building local online websites...which SELL! 8 Get The Best Out Of WordPress For Selling Your Local Produce Online...with Woocommerce! 9 Has This Helped You In Understanding How To Sell Your Produce Online? 10 Want a helping hand in preparing your online farm shop for higher heights? Learn how to successfully sell your farm produce online...a comprehensive guide! This is an in-depth guide, showing you how to sell produce online. We cover everything you need to know to make it work for your online farm shop. So...have you ever wanted to know how to build your own industry standard e-commerce farm business? 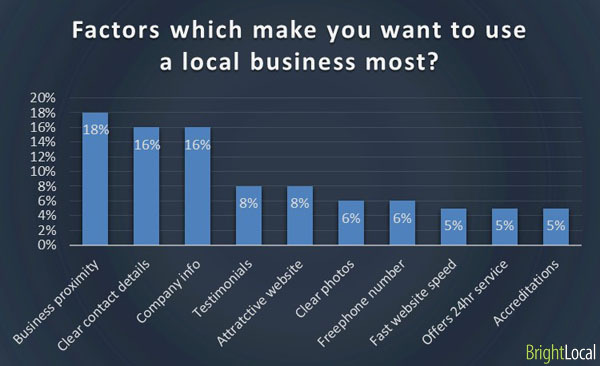 Our experience in building local online websites...which SELL! We've been helping local business sell online now for about 8 years. Both service businesses and product businesses alike. We have seen so much of what works and have also had the privilege of seeing what doesn't. We've helped start-ups, as well as existing businesses get better online. Our strategy for success is based on organic growth and long term market share ownership. Simply put, zero-debt and future friendly. 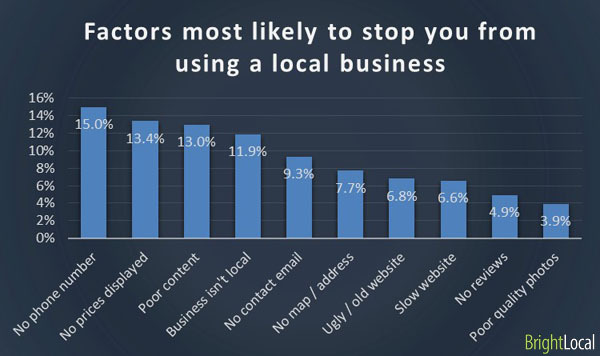 Local SEO software purveyors & experts, Bright Local, published some very useful tips uncovering to behavioural patterns and motives of search users looking for local businesses online. [They] asked 4 questions relating to the design & content of local business websites. In total, Brightlocal fielded 811 responses from their panel and collated the following results. With the criteria above, the panel of local consumers would determine if a business is a good fit for their needs. In conclusion, be transparent, be clear, comprehensive and concise. Invest in a smart and clean looking web design. Make sure the most important 'transactional decision making detail' is upfront. Give the physical reassurances to consumers of visiting your brick and mortar premises. Keep products, prices and phone number upfront. Keep your physical address in full view at all times. Provide an email address for direct contact as rather than a contact web form. E-commerce (online shopping) is dynamic. It exists in a constant state of change. Ecommerce website therefore must embrace change, with ease! Products and related service information is often (...if not continuously) being added, taken away or changed. Data is the predominant driver of change in e-commerce. Large amounts of commercial data is generated, processed, stored, augmented, shared, analysed etc. Where web technology is concerned, the ideal tool for efficiently and effectively managing a content intense workflow is a content management system. CMS (content management software) makes the handling of web content by businesses quick, easy and automated. CMS platforms are also used by multiple users, with varying & customisable levels of permission. ...but what are the bottom-line business benefits in a nutshell? set-up your online shop as a solid match for exactly how you run your business. Get it functioning just right for optimal customer satisfaction and sales. make selling produce online easy with a website that works well with Google and other search engines. This means when customers search for your produce online, they consistently find you. Also, you lower the technical bar of competency allowing internal staff with lower IT proficiency to add substantial value. There are all kinds of digital content and also many reasons why you online farm shop should use a variety of digital information. What is the best content management system to use for selling produce online? In our opinion = WordPress CMS. WordPress is a software platform which makes building content rich, business websites easy for everyone. Yet, it is equally effective in the hands of technically practiced professionals as well as non-tech newcomers. approximately 15 years to date of publishing. approximately 30% of all websites use WordPress. over half of CMS based websites to date use WordPress...the nearest is Joomla with 8.9%. released as an OpenSource project, without licencing restrictions. Many use it and extend it's use all the time. videos, how-tos, instructionals, infographics, podcasts...you name it, you can learn by it. so flexible, all you need to do is plan what you want it to do and you won't struggle to discover a solution. API friendly software enables WordPress to collaborate well with 3rd party add ons and software programs. host your own site on a server of your choice (there are loads of beginner level online hosts with cheap charges. What is a web theme? Web themes control styling and appearance of website. They are a combination of pre-configured features and characteristics which can be changed to suit the purpose. Some themes are more flexible than others. Others require more technical know-how, whereas some allow you to get going right away from scratch. You don't always have to pay to get a theme, but typically if you do - you could get more refined results. So what is so different about the Genesis Framework? In our own words, we'd say it is stability with variability. We've handled loads of web themes and frameworks over the years. It's been in our interests to do so, seeing we've consistently used WordPress to build clients websites for 8 years now. We've always sought to do things better, quicker, cheaper and with more profitable results all-round. The theme or framework which offers the best return-on-investment been by far has been - Genesis Framework. We particularly like the fact that you can once you get used to it, it is very easy to customise. However much you stretch it though, you never lose it's core qualities, or feel. It also allows 3rd party software plugins to function and render consistently well across all device formats & browsers. Simply put, if you are going to invest in an online WordPress powered farm shop - Genesis Framework is a prudent choice. ...now let's get back to business. Your farm-based business may not just be agricultural. Similarly, your website needs to reflect the diversity of your enterprise. hire equipment, land or building space...and much more! Your business model will dictate the content and architecture of the website. In the example below, we suggest a typical set of core web page pages for a rural business. ...offer bulk buy discounts? Dedicate a page to detailing your wholesale terms and conditions - with ordering capability. ...allow attendees to book and pay in advance for reserving places on your courses. There might be need for more or less than the quota above within your farm business website. Can you suggest anymore? Comment below. Need a different line-up of pages? The great thing about content management systems, like WordPress (mentioned in the chapter above), is that you can always add or subtract pages with ease. Plus, you can flexibly customise page function and behaviour by selecting software options in the background. Now, what about your customers perspective? What can users of your website expect to see? And how can you improve their experience? E-commerce agency, Nublue, have produced the infographic below in order to sum up a successful approach to engaging customers online for your farm shop website. & we hope you'll find it useful too. When selling products to a local marketplace, there are just somethings that you don't play around with. They are staple markers of success. They help engage your marketplace and establish you as credible and worth buying from. Otherwise known as NAP, in local SEO speak - this simply are your business's most relevant proofs of credibility. When Google and other search engines want to pin you down for location on their map - this is the primary determinant. Get this right and consistent in format across the web and you'll make a strong impression upon local search. According to leading industry studies, younger users particularly (18-33+) engage more favourably with media rich website presentations. ...get savvy with your digital content. Genuine first hand experience of product or service quality goes a long way. Often when customers receive great value from a product or service - they're just brimming to tell someone about it. Convert such appreciation into attractive visual content, such as photo or video, for sharing with newcomers. Customers can get outspoken and passionate about particular products or services. Where it's on-topic, why not nurture constructive discourse via your website? This ups your content freshness, without you having to do all the hard work of curation. It also gives valuable user insight into how your products or services are perceived by your market. With over 80% of local business online search made using a smart phone, it would be remiss to ignore mobile readiness. Why not develop a mobile-first online farm shop? We've seen conversion rates on farm produce increase by as much as 200%, following the adoption of a mobile first design. Google and other search engines like it alot when websites make things easy for them to search. ...both with robots and people. Schema.org is a structured web data project part founded by Google (...hint, hint), Microsoft, Yahoo and Yandex - which also just happen to be the top online search engine companies. Schema.org comprises a set of vocabularies, encoded in various formats. It basically does the job of granting search engines better understanding of what purpose your page fulfills. Better understanding of your content = less friction in their organising of your content for search rankings and better user experiences. Brand identity online should reinforce your street level presentation. Consistency will increase your brand awareness and credibility overall. The more people see your business presentation portray quality and attention to detail, this offers assurance that an investment in product or service will be in safe hands. Get The Best Out Of WordPress For Selling Your Local Produce Online...with Woocommerce! - VL Omni Data Integration "Woocommerce Infographic: How To Integrate Your Webstore." Woocommerce is a WordPress-based plugin software, which instantly transforms your humble website or blog into an online shop. Now owned by the makers of WordPress itself, Woocommerce has fast become a leading digital marketing tool for selling online. Because of it's scalability and usability for both storeowners and customers, we highly recommend it to you as a means of selling your produce online. Whether you are just starting up, or looking to migrate an existing successful ecommerce operation - Woocommerce has just what you need. Any doubt...ask your hosting company technical support, or sales team. Struggling for a hosting recommendation? Woocommerce give Siteground.co.uk the nod. One of our clients use them - to date, their customer service responsiveness and general product performance has been excellent. In WordPress jargon, widgets are page elements which sit in the margin of the page, either to the right or to the left of the main page content. The widgets which sit in this area usually perform specialised tasks. These functions improve navigation experience of users, enabling them to find products they desire with much ease. Shortcodes are Woocommerce's way of displaying shop features by way of writing web code in quick and easy shorthand. Various product attributes like: SKUs etc. Use of shortcodes saves time and enables non-coders to insert such functions into the website with ease. Woocommerce comes with built-in translation readiness in any language for which there has been a translation file submitted. There are currently (at the time of publication - 10.10.2018) 176 language files available - covering languages from Afrikaans to Zulu. Woocommerce is able to calculate and apply taxation rules to purchases of products in the checkout. These rules are controlled as administration options in the WordPress dashboard. Variable rates of levy according to shipping options or products chosen etc. can be applied quite simply. The full range of currency options are available with Woocommerce stores. However, the software is currently only able to support one currency being in use for any one particular installation. In the admin dashboard, all your order detail is held in one easy to reach section. Within the same area, it is possible to add and track the performance of coupon codes related to your marketing campaigns. Products & categories are classified and categorised very strictly to avoid duplicate items. This control is reinforced by page addresses possessing a unique permalink (URL). There is a vocabulary for identifying specific functional issues, which occur within your online shop from time to time. These notifications make it very easy to pinpoint any problems and shave down response time. Want Woocommerce to talk to a 3rd party software, like and email marketing provider? By use of webhooks you can seamlessly integrate functionality with other compatible software. Great added value and minimises upheaval - keeping things within your business connected. Woocommerce makes it very simple to add and manage products within your online farm shop. Product variations also can simply be programmed without duplicating large rafts of content. Shipping classes can be applied as rules to assist customers select their preferable methods and tariffs. Carousel images or static image galleries can be set-up on product pages - accompanying product descriptions. Product attributes can easily be amended at the click of a few keys. Adjust image dimensions in order to avoid poorly resolved picture quality. Publish links to other products on product pages which have complimentary qualities, encouraging cross/up sell. Bulk import and export product details using CSV (the simple file format utilised by tabular data crunching software like MS Excel). Have any urgent messages which you wish to communicate to all store visitors? This banner function enables you to publish universal notices with high priority, so that nobody misses out. Paypal - online payment system for sending and accepting payments over the internet, without having to input your payment details each time. Woocommerce supports automatic refunds, as long as your chosen gateway is compatible via API code. ...when a customer refund has been authorised by you or staff, you are able via Woocommerce admin dashboard to flag the original purchase as 'refunded' - this in turn will trigger the actual return of funds to your customer via the payment gateway used. Want to know if your preferred payment gateway is compatible with Woocommerce auto refunds? Click here. Manual refunds...flag it up in Woocommerce admin dashboard and separately log into the payment gateway and process the return of funds. Stay on top of monitoring for commercial goals and objectives with Woocommerce reporting. Generate reports to provide managerial insight of online shop performance. Report by...sales, customer, by stock/inventory or by taxes - even export data to user friendly tabular format CSV. Need a quick commercial overview of performance at your finger tips - especially during relevant online administrative events like logging in? See the Woocommerce KPI (key performance indicator) dashboard. Use Etsy? - Migrate To Woocommerce! If you are already selling craft products via Etsy? If you want to change over your online shop to Woocommerce, there is a one-time import utility available which allows for simple transfer of your product data. Looking to integrate online bookings into your online farm shop...for events reservations, perhaps? Extend the basic shop functioning of your Woocommerce with this plugin offering configurable settings and flexibility to suit your event booking needs. Have a need to restrict content and resources within your online farm shop? Use this plugin to extend Woocommerce allowing you to manage membership privileges among your customer base. Set time sensitive restrictions to membership offerings and with precision pinpoint the restricted web page content by page or post. Has This Helped You In Understanding How To Sell Your Produce Online? Because of the nature of the discipline involved, it is quite a technical read. ...or, vastly improve your shop should you have one already. Want a helping hand in preparing your online farm shop for higher heights? We'd be happy to share a professional opinion - or even, perhaps work with you on your project. Previous Post: « Transform Farm Gate Sales – With Collaborative Direct Farm Marketing!